During reinstalling Windows on your PC, you inevitably end up losing your installed third party software and perhaps their license keys too. Before you reinstall Windows, it is essential that you note down the license keys for all the installed software in Windows. 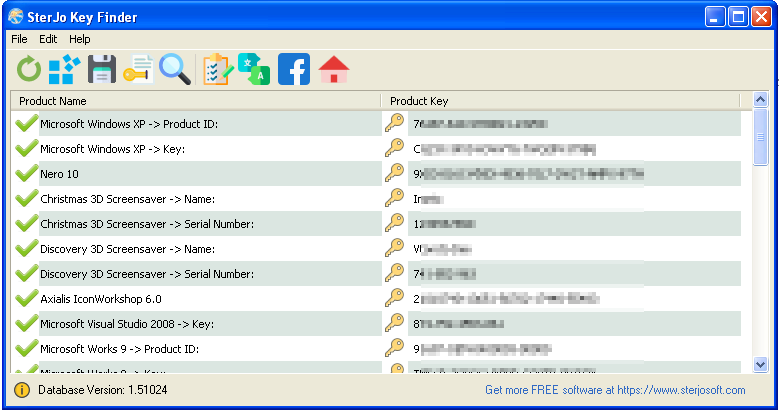 If you want to find and save the license keys of installed software, then you can use the free SterJo Key Finder. SterJo Key Finder is a free program for Windows that scans your PC for license keys for many different software programs including (but not limited to) Microsoft Windows (both Windows 7 and Windows 8 product key and the old Windows XP), Microsoft Office product key (office 2010 product key, office 2013 key), Microsoft Visual Studio, ACDSee, AutoCAD, Corel Draw and many more. And it’s pretty simple - all you have to do is download it, extract it to a folder and run it from there. It will soon detect all the software license keys on your computer and display them to you in a list format. You\'ll find it pretty useful. It’s main advantages are that it can display product keys for various software. It detects your installed programs automatically and it lists them immediately. The software can be installed swiftly, it does not require too many resources and it is free. Also, it can be used to detect the license keys not only from the computer on which it is running butalso from a dead unbootable computer. What you can do is take out the hard disk of non-booting computer, attach it to a working computer as a secondary hard disk, boot into working Windows and then run SterJo Key Finder. It will find the product keys for your installed applications immediately, saving you from unpleasant situations. Sticky Password FREE is the password manager with everything you need for secure passwords and online form filling. You`ll have safe passwords and automatic login and one-click form filling. The portable version is included free.